How do you want to pay for your phone system? Who do you want to have manage it and handle end user issues? What carrier services are available at your location(s)? Do you have a reliable infrastructure and the connections to support your entire company? Let's break each down, and then assess their pros and cons. In the end, I hope to leave you with a better understanding of which type of phone system is best suited for your needs. 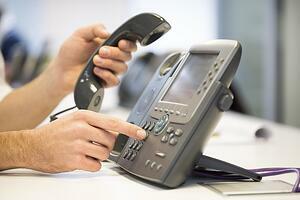 Hosted voice phones work the same as traditional phones - with a handset, cradle and buttons. But, rather than relying on a standard phone line, these phones have an Ethernet or Internet connection that carries phone calls over an IP data network, and ultimately, the cloud. This configuration allows you to save money on phone services because your calls will travel over a data network or the Internet, rather than requiring separate phone lines. These phone systems are easily scalable and feature-rich (without driving the cost up), and you have the option to own or rent the hardware from a provider. A PBX, or Private Branch Exchange, is the traditional phone system that has existed in offices since the telephone was introduced. The simplest PBX phone systems available feature a box in your office that connects the internal devices and lines within your office to external lines, and is capable of carrying out multiple functions such as call holding and forwarding. VoIP (Voice over IP) is another on-premise phone solution that uses your network infrastructure to deliver voice service to end users. Both on-premise phone systems are easy to use and manage, but less flexible as your company evolves. And, because your investment is made up front, the ROI over time is favorable. And, you own all the hardware. Take a look at the pros and cons it has to offer below. Both on-premise and hosted voice phone systems are effective and reliable phone systems that offer different benefits. These systems are compatible with different types of businesses, depending on what each business is looking for in a phone system. But this wouldn't be a showdown if a winner wasn't chosen. I can't honestly say one system/approach is better than the other. What I can say is this: each system is better for specific communication requirements based on your technology lifecycle, carrier options and existing contractual obligations. For the most part, when advanced features and complex integrations are required and you have a robust and reliable data network and infrastructure, the on-premise system is often best. Alternatively, companies with a mobile workforce, seasonal changes in call volume, multiple locations or the desire to standardize your communication platform should consider adopting a hosted voice solution.